On Monday December 15th, following a disappointing loss (at this point, aren't they all?) to the New York Rangers, the Edmonton Oilers finally fired head coach Dallas Eakins. During my absence the Oilers finally did win a single game to avoid beating the team record 13-game losing streak, and also to prove me wrong by defeating a Western Conference opponent in 2014. But that wasn't enough to save Eakin's job. It bought him an extra couple games, but losing to a Rangers team that played the night before seemed to be the last straw. The hilarious video that's popular and making the rounds this week is the post-game presser where Björn Lundqvist (no, seriously, that's his name) laughs at how few scoring chances the Oilers had against his team and how easy his job was. Worse still, the Rangers were playing the second half of a back-to-back. The Oilers shouldn't have been this easy against New York. Yet somehow they were. And Eakins lost his job the next day. Reporter: I know we were talking about the keys to the game being a good start, but there have been a lot of games this season where we've been down two or three nothing in the first or second period, and you guys all want to start the game better but what do you think the block is from actually grabbing the lead more often in games, or you're only down one nothing after a period or whatever? Eakins: It's, uh, I firmly don't understand it, and I don't know if its a maturity level of being in the league for a long time and understanding that that first shift is going to be just as important as the last shift of the game, just as important as the middle shift, and believe me we have talked about this a ton. We've tried different guys starting, we've tried different lines starting the game. Look, you can't envision any other scenario where an Eakins-like guy is in the hot seat and gives those sort of answers to questions. None at all. Imagine being the general manager of one of those big upgraders on the east side of Edmonton, and being far behind schedule and having questions from your boss about what's wrong and how to fix it. "I don't know, I don't understand what's wrong. Or how to fix it. I've tried a lot of stuff but nothing is working." Imagine being a case worker at the YMCA and you're being asked how you can help support one of your charges: "I firmly don't understand. Maybe they aren't mature enough?" Results matter. 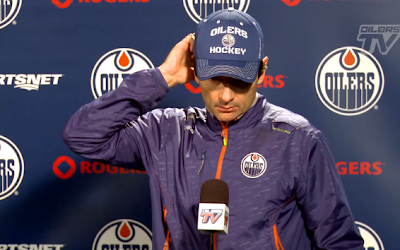 Dallas Eakins couldn't get results, but that's not always enough to cost somebody the job. What will cost you the job, every single time, is being the person responsible for fixing a problem and admitting as it sinks your organization that you don't know what exactly the problem is or how to fix it.